Collaborative Innovation at Agiliad is driven by our customers, current and prospective, who differentiate through technology and engineering innovation and who continuously challenge us to contribute to their innovation. It is also driven by our engineers and teams who thrive on opportunities to extend their horizons, question conventional thinking, and be challenged. Simply, we want to help our customers build great products and innovate. For our customers it means that we are flexible, invest proactively in relevant technology and assets, and can engage in upper lifecycle activities in a product’s conceptualization. 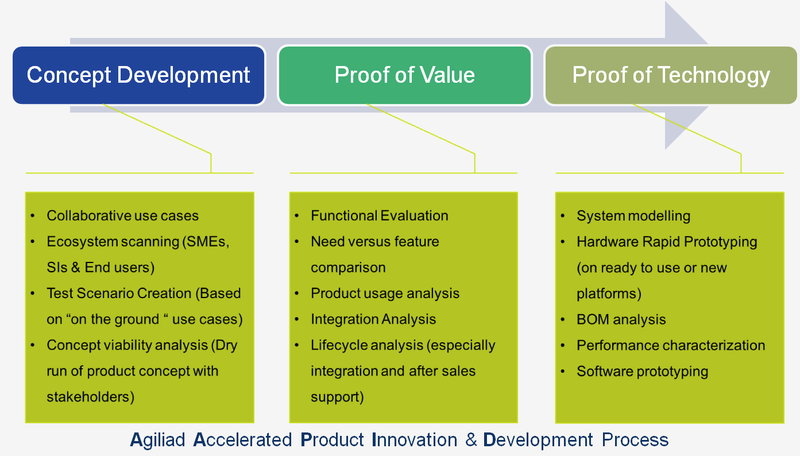 This includes activities like collaborative concept development, proof of value and proof of technology. It also presents our customers with an opportunity to realize option value for ideas in the pipeline and take them to a decision making stage. We can take high level problem statements from our customers and if required, build functional prototypes using an accelerated and highly optimized process. Our domain and technology leadership team understand emerging markets and can help our customers innovate for these markets. This requires market analysis and study, need and feature analysis, and end use analysis. Our leadership and organization are designed to facilitate high-impact small teams. We believe that in the engineering and R&D world our customers' expectations can only be met by teams that can deliver non-linear output over time. The conversation we have is not about savings per unit in their short term, but the overall value that gets generated in the course of an engagement (whether in terms of quality, time to market, or other dimension). At Agiliad we believe that being part of our customers’ innovation journey is our business and we structure our business models with this longer term view in mind. While we understand that each customer and engagement situation is unique, it is important that we both understand our objectives. We are completely transparent with our customers in every regard. We continuously look at opportunities to invest proactively in acquiring technology skills and assets relevant to our customers as well as areas where we can jointly work with our customers to achieve common long term goals. A value optimized hybrid model where we work closely with the customer on the upper life cycle activities and then independently own and execute the later stage of the program. This allows our customers flexibility in evolving the product/project and requirements, mitigate most of the risks upfront, and to let us share the risk on downstream activities. We believe that emerging markets, like India, are already pushing the next wave of innovation and growth for engineering/technology businesses. Our focus on working with local innovation ecosystems and a proactive approach to working with local companies on local problems makes us an ideal partner to help conceive and build products tailored for these markets. We strive to pursue opportunities that allow us to contribute directly in solving emerging market needs, especially those having high social impact. We are building a strong ecosystem of partners to complement our capabilities. These are researchers and academia, outsourced small and medium manufacturing partners and technology start-ups. We hire from leading global technology companies and understand how excellent products are built. Our leaders and our engineers have on-the-ground knowledge and want to see tangible impact in their communities.